Getting a properly sized air filter is one of the most important things a person can do to protect their home and their health. Not only do properly filtered systems last years longer, they also run much more efficiently, resulting in energy savings. 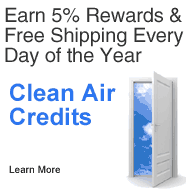 But most importantly, recent studies have linked polluted indoor air to heart disease, stroke and cancer. If air has a choice between resistance and no resistance, it will take the path of least resistance every time. This means that if your air filter is not properly sized and sealed, all the air and pollution will just go around it and avoid filtration completely. To make matters worse, some people purchase high efficiency air filters, to get better filtration. But higher efficiency, usually means greater resistance, which only compounds the problem. How do I know what size air filter I need? Check to see if your furnace or A/C has an existing air filter in it. If so, does it fit properly? If it contains a disposable furnace filter, are there any crushed corners or has the filter been forced into the system to fit? If not, measure the existing filter with a tape measure. That is the replacement size you should be ordering your new HealthSmart air filter. 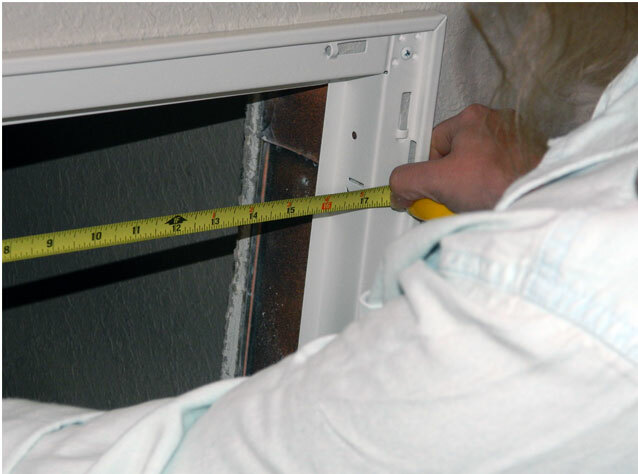 If the filter does not fit properly, or you do not have an existing air filter in your system, you will have to measure the grill opening or the filter slot of your furnace/air handler. If you have any questions, or concerns - we're here to help! Click Here to ask your question, we'll respond within 24 hours. Where are air filters located? Air filters can be found inside of the heating / cooling system or inside the return grills in your home. These return grills might be on the ceiling or on a wall. How do I measure air filters in grills or vents? 1. Many air filter grills have obstructions such as stop tabs, rivets and screws. You want to make sure you take your measurement between these objects and subtract 3/8 inch, so the air filter will fit between them when you install it. 2. Because HealthSmart air filters feature a Patented Leak-Guard seal, the filter does not have to fit edge to edge tight. As long as your measurement is larger then the inner lip of the grill, your filter will seal properly. Leave yourself room to remove and re-install it easily. 3. Always open the air filter grill to take the measurement, don't assume the inside measurement is the same as the outside. 4. 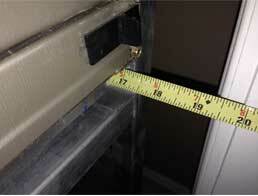 Do not take your measurement from the size printed on your throw away type furnace filters. Many times the size printed on those filters is a nominal size and not the size of the actual filter. It is common for a filter to be undercut up to 1/2" from the nominal size. 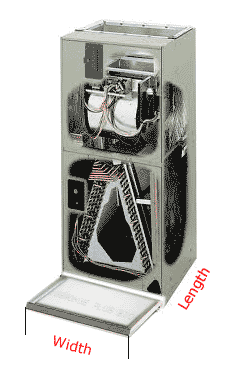 How do I measure air filters in furnaces and air handlers? 1. When measuring the filter track or slot, look for any obstructions, such as screws. Be sure to allow for any obstruction in your measurements. Measure length of filter, front to back. 2. Because HealthSmart air filters feature a Patented Leak-Guard seal, the filter does not have to fit edge to edge tight. As long as your measurement is larger then the inner lip of the track, your filter will seal properly. Leave yourself room to remove and re-install it easily. 3. 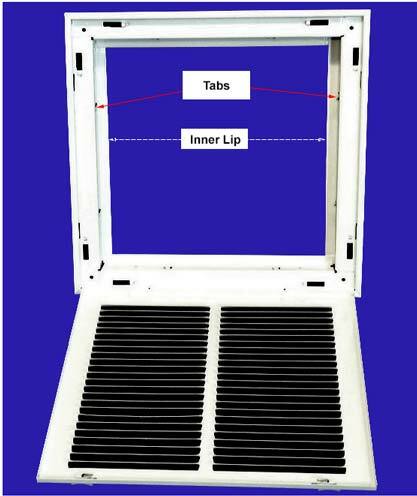 HealthSmart air filter frame is made of sturdy aluminum and will not bend. 4. Take your time. Get it right, you'll never have to do it again, these air filter frames can last a lifetime!